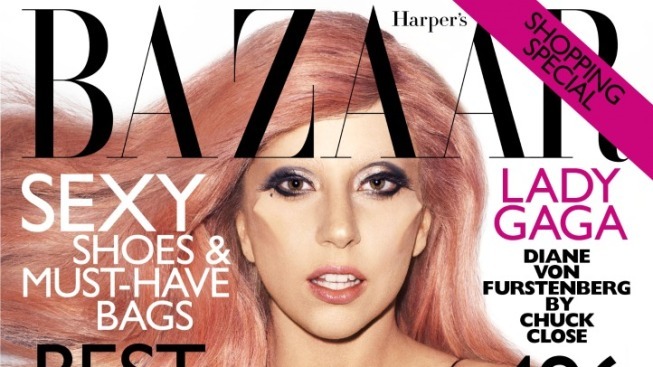 Gaga Covers Harper's Bazaar Sporting Horn-Like "Bones"
"They've always been inside of me, but I have been waiting for the right time to reveal to the universe who I truly am ... It's artistic expression," Gaga says. "It's a performance-art piece. I have never, ever encouraged my fans or anyone to harm themselves, nor do I romanticize masochism. Body modification is part of the overarching analysis of 'Born This Way.' In the video, we use Rico, who is tattooed head to toe [including a skull on his face]. He was born that way. Although he wasn't born with tattoos, it was his ultimate destiny to become the man he is today." Gaga goes on point out that it's unfair to take issue with body modification, when other pop singers promote a different kind of modification in the form of plastic surgery. "I think that promoting insecurity in the form of plastic surgery is infinitely more harmful than an artistic expression related to body modification," Gaga told the magazine. She also discusses the influence of the late designer Alexander McQueen on her work. Specifically, Gaga credits McQueen with giving her the album's lead track: "Right after he died, I wrote 'Born This Way.' I think he's up in heaven with fashion strings in his hands, marionetting away, planning this whole thing."